The International Tang Soo Do Federation (ITF) hosted its 15th World Championship this summer. Local karate schools, including C.S. Kim Karate - McMurray, joined martial artists from eight different countries to participate in the event. "The nicest thing is seeing people from all over the world getting together with one cause, just to train," Dean Kelly, the head instructor at C.S. Kim Karate - McMurray said. 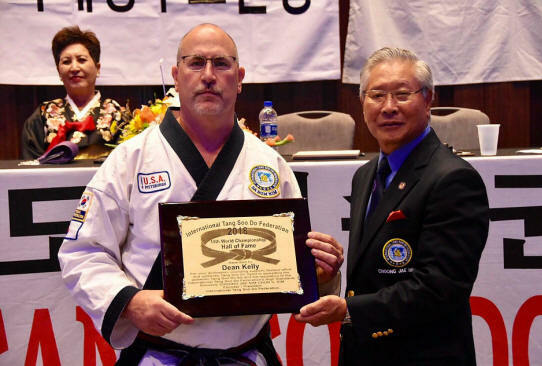 Master Kelly was inducted into the ITF Hall of Fame at the tournament. C.S. Kim Karate McMurray sent 30 students to the tournament, all of whom medaled in at least one event. The school's other instructors also performed well at the tournament. Dean Kelly Jr. won first place in Masters breaking. Jeremy Kelly took first place in Masters forms, sparring, and weapons. Julia Felton earned first place in her black belt forms division and second place in her black belt weapons division. In addition to taking third place in his black belt forms division, Max Szalla earned second place in his black belt weapons and breaking divisions. Alex Burdelski won second place in his black belt forms division and third place in his black belt sparring division. The tournament was run by Grand Master C.S. Kim, who, at age 77, continues to actively participate in the event. The tournament, which was held in Washington, DC, took place on July 27-29. The next ITF World Tournament will be held in Orlando, Florida, in 2020.